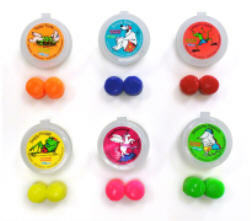 Floating Putty Buddies® ear plugs are made with a special, patented Flo-Tek® silicone formula. They float easily on water so they can always be found if dropped or dislodged! Each pair of Putty Buddies® comes with it's own unique plastic carrying case and is available in six bright neon colors: Blue, Red, Green, Yellow, Orange and Pink. Recommended by physician's for prevention of swimmer's ear or for kids with ear tubes.